The City of Alexandria is considering new dock locations for Capital Bikeshare. See the full news release below and follow the link to see the whole plan in context and provide feedback. Two of the proposed locations are near Arlandria. Two are near Potomac Yard. Alexandria is expanding its Capital Bikeshare network and welcomes feedback regarding the proposed bikeshare station locations. Community input can be provided through an online form through June 1. The online form can be accessed at https://www.alexandriava.gov/95476. Each proposed bikeshare station will be brought before the Traffic & Parking Board for approval. The Traffic & Parking Board public hearing will take place on Monday, June 26, 2017 in City Hall Council Chambers at 7:30 p.m. For this round of expansion, the City will add 10 additional bikeshare stations with installation to occur in Spring 2018. Bike sharing is public transportation using bicycles, and cities around the world provide bike sharing systems as a transportation option for residents and visitors. The City of Alexandria's bike sharing program, in partnership with the District Department of Transportation, Arlington County, Fairfax County, and Montgomery County, is called Capital Bikeshare. With Capital Bikeshare, you can choose from nearly 400 stations in the region, and return a bike to any station near your destination. Motivate operates the system for Alexandria, Fairfax County, Montgomery County, Arlington County, and Washington, D.C. Alexandria joined the regional Capital Bikeshare network in September 2012 with eight stations and now is up to 31 stations serving Old Town, Parker-Gray, Carlyle, Del Ray, Arlandria, Rosemont, and Bradlee neighborhoods. For more information about the bikeshare program, visit alexandriava.gov/Bikesharing, or contact CapitalBikeshare@alexandriava.gov. Designation marks the honor has been awarded to a Virginia Park and only the third time to a park in the Washington Metropolitan Area, after the National Mall and Yards Park. In recognition of its innovative and effective approach to community engagement and volunteer coordination, Four Mile Run Park has been named a “Frontline Park,” a nationwide competition sponsored each year by City Parks Alliance. In the early 70s, flooding caused incredible damage to Four Mile Run Park and surrounding residential area. The Army Corps of Engineers' flood control project managed to mitigate future flooding threats, but promised improvements to the park never occurred. As a result, the park was in severe need of restoration and maintenance, some of which was addressed through volunteer efforts in the early 2000s, but public investment in the park was reduced as the region dealt with the fallout of the financial crisis. In recent years, dedicated community leaders and volunteers in Arlandria have worked tirelessly to maintain, restore, and program Four Mile Run Park to prevent it from falling into disrepair. A group of architects came together to create a work plan for the site, highlighting priority areas and making recommendations on where funds should be allocated in the absence of city attention to the space. 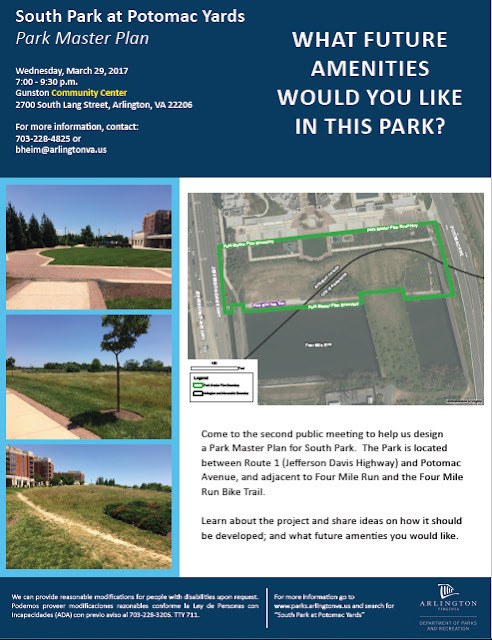 While a task force made up of citizens from both Alexandria and neighboring Arlington County galvanized and shepherded public investment for stream and wetland restoration resulting in award-winning habitat creation in the park, the community has stepped in to make it cleaner and safer for visitors who come from all over the region to fish, bike the trails, walk dogs, and participate in other recreational activities. In 2016, the nonprofit Four Mile Run Conservatory Foundation was incorporated to increase capacity for fundraising and community engagement. The step toward formalizing the ad hoc approach to implementing a vision for the park represents the culmination of years of volunteer work from the community, which has been remarkable on its own. Each month City Parks Alliance names one “Frontline Park” as a standout example of urban park excellence, innovation and stewardship from across the country. The program identifies urban parks and programs that find innovative ways to meet the unique challenges facing cities today. The site was selected from a field of more than 30 entries across the country. As a Frontline Park, Four Mile Run Park will be featured on the City Parks Alliance website and in articles and blog posts by the organization. 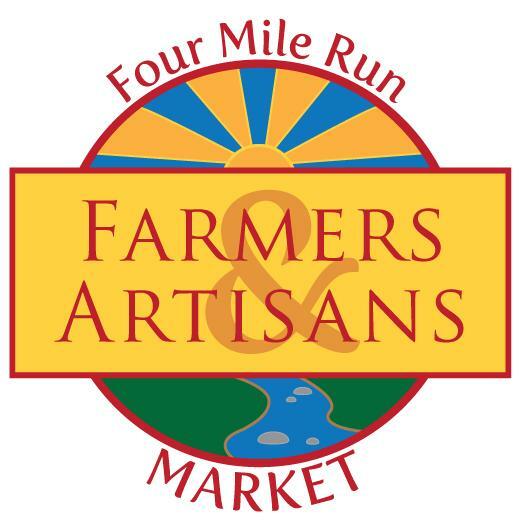 The Four Mile Run Conservatory is Springing2Action in Four Mile Run Park! Our kids are picking up after us. Let's not let them down. 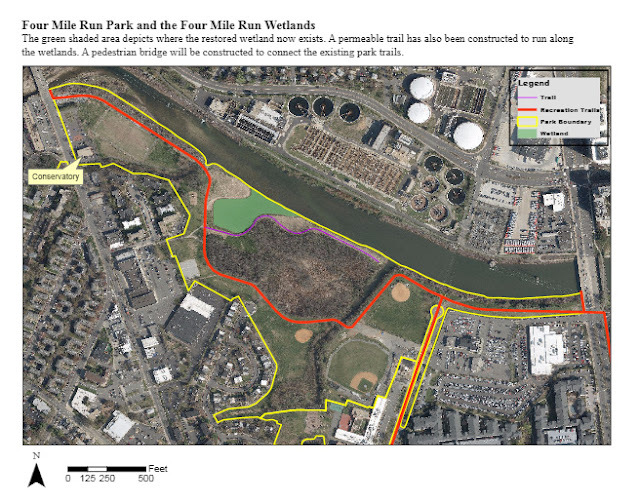 The Four Mile Run Conservatory is Springing2Action in Four Mile Run Park! Spring2ACTion is a 24-hour online event that provides a simple way to connect donors to the charitable causes they care about most and encourages them to take action. This virtual fundraising effort, hosted by ACT with the help of generous sponsors, will offer local nonprofits the chance to raise thousands of dollars for the benefit of all Alexandria. By the time the group of summer camp kids got finished their clean-up of Four Mile Run Park in the summer of 2010, the results were astounding. In little over an hour, there lay in one big pile, a clump of 30 gallon trash bags, all mostly full. The thing was: it didn't look that bad when they started. Other groups had been through the park all summer and it had never looked better....well, at least not in the last decade. And yet, just a few weeks later, another clean-up turned up piles of more trash. It's a constant struggle. I asked the kids what they thought was needed to keep some folks from having to continuously clean up after other folks. I suggested more trash cans. They suggested more police patrols and security cameras. All I know is that the winter hasn't been kind to the Four Mile Run. Without nice weather to bring volunteers out, the trash and debris, depressingly, is back. Without some intervening force to keep the litter out of the stream only the armies of helpers that come out month after month can keep the stream alive. The Four Mile Run Conservatory Foundation wants to be that force. As we continue working to plant trees and remove invasive plants, this year we also aim to reduce litter throughout lower Four Mile Run with "Clean Stream Extreme"!! Help us equip volunteers with tools for stream clean-ups and install recycling bins & litter traps to make that less necessary. Our Spring2Action fundraising goal is participation - 100 donors, at any giving level. Help us today!! In the past year, Four Mile Run Conservatory Foundation volunteers contributed more than 400 hours of their time in improving the park, planting 26 trees, removing 12 cubic yards of invasive Kudzu vines, and documenting the wildlife that call Four Mile Run Park home. In March, we finished fundraising toward our 'Kick the Habit' project to install water bottle/jug fillers at the City's two most heavily used athletic facilities. These will soon be installed and we will conduct outreach to get citizens to 'Kick the Habit' of disposable single-use water bottles, which are such a major component of the litter found in Four Mile Run. With your involvement and support, each day Four Mile Run becomes cleaner, healthier, and more beautiful. Help 4MR Wetland Restoration win BUBBA Grand Prize! Vote for Four Mile Run Wetland Restoration to win the 2017 BUBBA Grand Prize! The 4MR Wetland Restoration project was just awarded Best Habitat Creation in the Best Urban BMP in the Bay Award (BUBBA) contest by the Chesapeake Stormwater Network! Each 1st place winner from each category now has the opportunity to compete for the $5,000 Grand Prize to go toward more park improvements. Voting closes on March 13th. The Best Urban BMP in the Bay Award contest (BUBBA) recognizes the best urban BMPs that have been installed in the Chesapeake Bay watershed. Local implementers of low impact designs tend to lead the way in trying new and innovative approaches to dealing with difficult stormwater problems. Each year, the Chesapeake Stormwater Network recognizes innovators in the field who are using new and innovative techniques for facing the challenges of stormwater management by awarding the Best Urban BMP in the Bay Award. 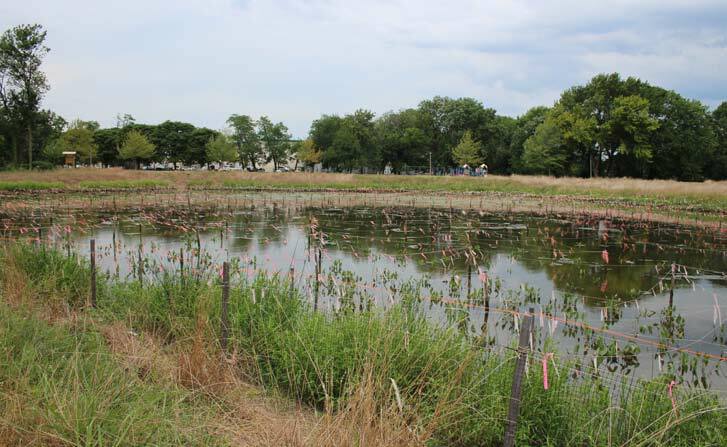 This two-acre wetland restoration project involved an extensive invasive species abatement plan and the establishment of several diverse habitat types through a watershed approach to design and planning. The restored wetland system now includes a low marsh zone, a high marsh zone and an upland meadow in order to provide both terrestrial and aquatic habitat improvements for frogs, song birds and native pollinators while treating stormwater runoff. The diversity of habitat types, a list of native species planted, and the comprehensive invasive species management approach helped this project to stand out as one that placed a clear emphasis on habitat creation during the project design.